Villagers claim their lives are being disrupted by a large number of lorries going to and from a building site. The 362-home scheme on farmland in Llay, near Wrexham, was controversially backed by the Welsh Government which overturned the council's refusal. 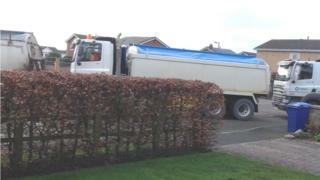 Residents in Gresford Road claim to have seen up to 130 lorries a day from early morning, blocking driveways. Wrexham council said planning enforcement officers would be looking into the complaints. Local people have complained the problems were happening despite planning conditions being imposed to prevent work starting until the crossroads near the Crown Pub were upgraded. Other constraints put in place by the council last August were designed to prevent drivers from blocking driveways and to restrict delivery hours. Llay councillor Rob Walsh said he had received as many as five calls an hour about disruption being caused by HGVs. "People are outraged about how this has been allowed to happen," he told the Local Democracy Reporting Service. "It's just the whole way this development has begun which has baffled and angered local residents." Villagers are also facing further disruption as part of Gresford Road is due to be closed for 16 weeks from late April to allow new drainage to be installed for the development. However, Dennis Owen, who lives opposite the site, believes the closure could last for as long six months by the time the second phase of drainage is put in. "There are at least 100 to 130 wagons going in and out every day," he said. "I went there yesterday and they were queuing to go out as some were queuing to go in." Anwyl Homes has declined to comment on the issues raised, while Bellway Homes has also been asked to respond to residents' concerns.